Secondary electron iamge (SEI) - this provides a topography image. The above images are from a Hastolloy powder metallurgy sample. 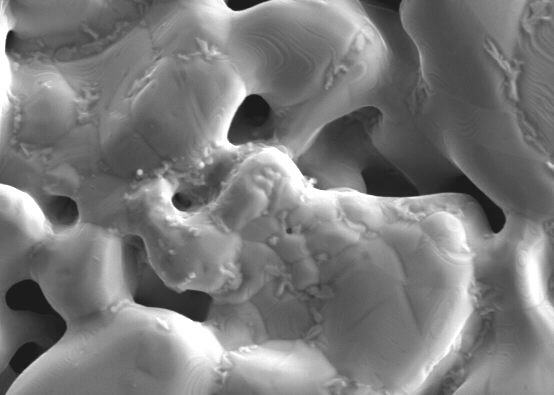 The BEI image shows the binding metal (tungsten). 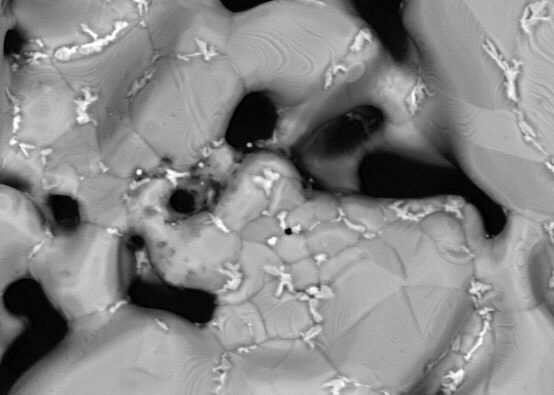 Note the high quality imagery which is a result of several factors including experience (>30 years), sample preparation (our full preparation laboratory), instrumentation (JEOL JSM-6300 SEM) and digital recording (Geller dPict32) capabilities. Our energy dispersive (EDS) x-ray detector is of the thin window type and can analyze elements down to Z=4 (boron). Please note that it is not our practice to perform quantitative EDS. For that we use the EPMA.